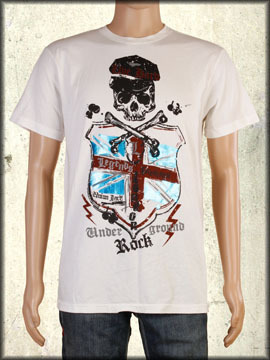 Motor City Legends Union Jack men's short sleeve t-shirt features a large union jack shield and black skull and crossbones that reads MC Legends presents Underground Rock with red and blue foil in the center. The back has an image of a large skull, crossbones with a shield and reads Live Hard across the top. Mineral washed for vintage look. 100% cotton, light weight, slim fit. Hand dyed with silicon wash for soft feel. Color: vintage white mineral wash.